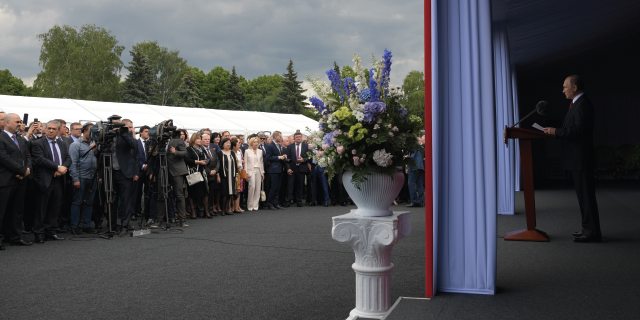 President Vladimir Putin’s handling of foreign affairs gets high ratings from most Russians, in contrast to more tempered views of his economic policies and anti-corruption efforts at home. 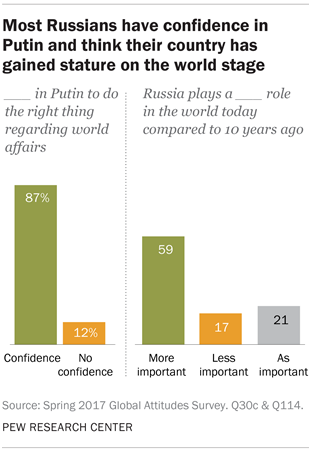 Confidence in Putin’s global leadership has been consistently strong over the decade-and-a-half that Pew Research Center has polled in Russia. Trust in the Russian leader has remained high since an increase in 2014, shortly after the conflict with Ukraine and subsequent annexation of Crimea. Today, however, Putin earns lower marks (63%) than he did two years ago (83%) for his handling of relations with Ukraine. Support for the Russian president has also declined when it comes to his approach to relations with the EU, China and the United States. Despite slippage in how well the public thinks their president is handling key foreign policies, a majority of Russians say their country plays a more important role on the world stage than it did 10 years ago. Putin’s 2015 decision to intervene in the Syrian conflict was a momentous change in Russia’s foreign policy. Today, the prevailing view among Russians is that their country should stay the course in Syria, keeping Russia’s military involvement at its current level (46%). Among those who would like to see a change in Russia’s stance, roughly three times as many support decreasing the level of Russia’s involvement (34%), as opposed to increasing it (11%). 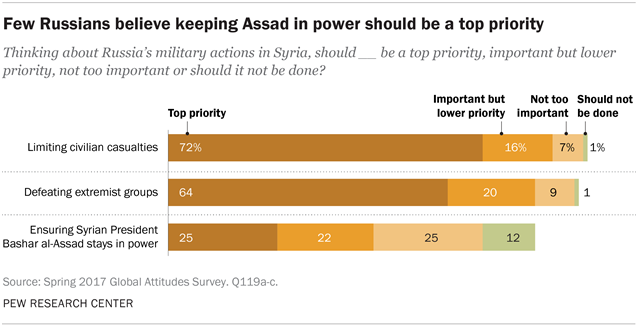 When asked about the purpose of their country’s military actions in Syria, majorities say limiting casualties (72%) and defeating extremist groups (64%) should be priorities, compared with just a quarter who say the same about the Kremlin’s apparent goal of keeping Syrian President Bashar al-Assad in power. Syria has been one factor affecting relations between Russia and the West. Another has been NATO. As of this spring, around four-in-ten Russians (41%) describe the trans-Atlantic security organization as a major threat to their homeland, down slightly from 50% in 2015. These are among the key findings of a new Pew Research Center survey, conducted among 1,002 respondents in Russia from Feb. 18 to April 3, 2017. At home, Russians most often cite rising prices as a very big problem (71%), followed by roughly six-in-ten (58%) who describe corrupt political leaders in the same terms. And at least half of the Russian public says lack of employment opportunities (54%), terrorism (54%), the gap between rich and poor (53%), crime (52%) and corrupt business leaders (50%) are very big problems. Overall assessments of the Russian economy are tepid but relatively upbeat compared with recent years. In 2015, almost three-quarters (73%) saw the economic situation as bad. Today, opinion is split (46% good vs. 49% bad). Russians are feeling slightly better about their own lives as well. Around half (51%) now say their personal economic situation is good, compared with 44% in 2015. However, not many Russians feel optimistic about the future: More than half (53%) expect the national economy to remain the same or worsen in the next year. Despite Russians’ lukewarm view of the economy, a majority (55%) still approves of Putin’s handling of the issue. Putin also has the support of more than half the country when it comes to energy policy and civil society. The only area included in the survey in which he fails to earn majority approval is the issue of corruption. Who’s Afraid of Jeremy Corbyn?